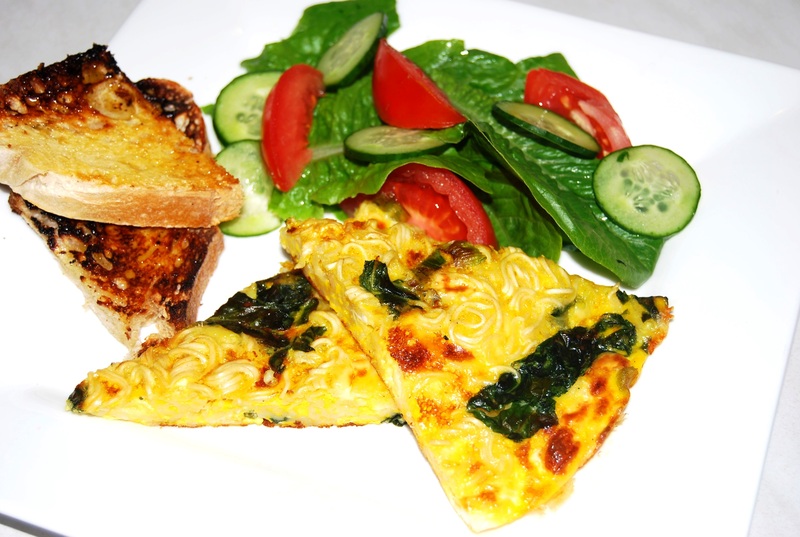 Adding low fat instant noodles to this simple frittata makes this a more nutritionally balanced dish that includes four of the five food groups. It can also be cooked in small patties and eaten as a healthy snack or popped in the lunch box and eaten cold. Prepare instant noodles according to packet directions without using the flavour sachet. Strain and set aside. In a bowl mix eggs, milk, cheese and feta. Add noodles and combine. Heat olive oil in a fry pan. Add spring onions and spinach and cook until onions have softened and spinach has wilted. Carefully pour the noodle mixture into the pan and mix gently until combined with the spinach and onions. Cook on low to medium heat for 10 minutes with a lid on the pan. To brown the surface of the frittata, place frypan under a hot grill for 2-3 minutes or until browned. Serve with salad and wholegrain toast. This is a great dish to add any left-over cooked vegetables. Canned and frozen vegetables will also suit. Other vegetables that can be added include roasted pumpkin, sweet potato and carrot. Also try zucchini, peas and corn.